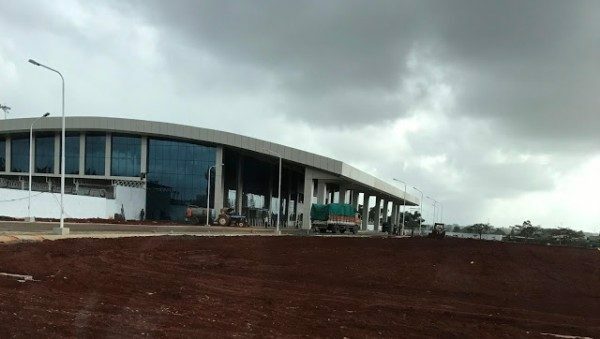 The New terminal building at the Sambra Belagavi Airport is almost ready and would be inaugurated on 14th September according to sources. The Hubballi and Belagavi New Terminal buildings are scheduled to inaugurated on the same day. The Belagavi (Sambra) airport runway expansion work is almost complete with all the Taxiway Edge Light Fittings, Approach, Threshold, End Light Fittings completed. The actual extension of the airport was planned in 1999 and the working airport was closed citing the up-gradation process. New Apron, Taxiway & Isolation Bay and associated works at Belagavi Airport. The project envisages providing Runway lighting, Taxiway Edge lighting, Approach Lighting and Laying of Cables is all been completed. The existing runway of 1830 m has now been extended to 2300 m and the width would remain the same to 45 m.
The new taxiway is 23 m wide, 228.5 m long with 3.5 mtrs wide shoulders on both sides. There will be provision of new Isolation Bay 120 m × 100 m and 270 m × 23 m Link Taxiway with 3.5 m wide shoulder suitable to cater for code “C” type of aircraft. A new parking apron of size 157.50 m × 130 m for parking aircraft 3 number Category C Aircrafts has been proposed. There is a provision of new Isolation Bay 120 m × 100 m and 270 m × 23 m Link Taxiway with 3.5m wide shoulder suitable to cater for code “C” type of aircraft. Traffic potential of Belagavi Airport for the year 2012-2013 is 378 aircraft movements and 13778 passengers & traffic forecast for 2015-16 is 754 aircraft movements and 47513 passengers. Forecast for 2022-2023 years is 1222 aircraft movements and 92590 passengers. The existing airport area is 360.34 acres and got an additional area of about 370 acres for its expansion. Hence, the total project area will be 730.34 acres. At present Belagavi airport have one runway oriented 08/26, 1,830m in length, apron of 6,916m2 terminal building of 1200m2. Previous articleWhere is S.M. Krishna? This is only tentative date.